← The Sports Archives – Cars that England’s Football Stars Drive! 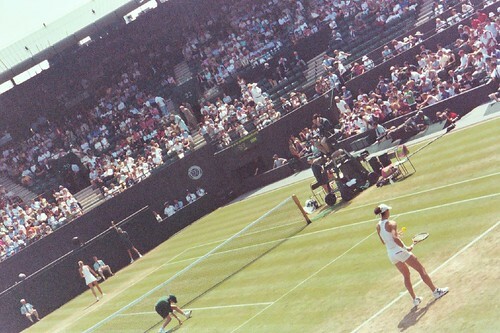 The Sports Archives – Warm up for Summer with Wimbledon 2012! With the Queen’s Club Championship well underway, the road to Wimbledon is drawing to a close, and the tournament is shaping up to be one of the most dramatic in recent years. For those not in the know, the All England Lawn Tennis Championships – Wimbledon to friends – has been running annually since 1877, the same year the original code of laws for the game of tennis were drawn up. The only event staged that year was the men’s singles, won by one Spencer Gore in a final watched by two hundred spectators who each paid a shilling for entry. In 1922 the original club moved to its current site in Church Road, where it now boasts a 15,000-seater Centre Court, now complete with retractable roof in case of the inevitable summer showers, the 11,400-seater No.1 Court, and Nos. 2 and 3 with 4,000 and 2,000 respectively. The winners of both the men’s and women’s singles titles will take away £1.1m, with £650k for the runner-up. The men’s tournament is expected to be a continuation of the battle for supremacy between current ATP Tour no.1 Novak Djokovic and Rafael Nadal, the second seed and most recent winner in their duel in the final of the French Open. Between them they have contested the finals of all four of the most recent slams, and at least one of them has appeared in the last nine, dating back to Roger Federer’s win over Andy Murray at the 2010 Australian Open. The bookmakers have not ruled either Murray or Federer out of the running just yet, though allowing for slightly shortened odds because of his status as a home favourite, Murray’s 8/1 rating does not bode well. Slightly more adventurous gamblers might fancy a flutter on Jo-Wilfried Tsonga, who came so close to upsetting Djokovic at the French, or Juan Martin Del Potro, who as one of an elite group of current pros with a slam under their belt shouldn’t be quickly dismissed. Over on the women’s side of the tournament, things are absolutely wide open; some commentators complain about the being of a lack of elite talent in the women’s draw, but whether or not that’s the case the winner is always difficult to pick. Serena Williams’ early defeat in Paris is clear proof that there are very few sure things in women’s tennis, and considering there have been six different winners at the last six slam tournaments, this year’s British Open should be no different. Despite her recent exit, Serena Williams still has her name on two of the last three Wimbledon trophies, and along with Maria Sharapova, who took the French Open and reached the finals of both the Australian and last year’s Wimbledon, will be the ones to beat this time around. That said, neither are clear favorites, and last year’s winner Petra Kvitová and current US Open champ Sam Stosur are both firmly in the running, perhaps in spite of Stosur’s notorious poor showings on grass. Outside shots include Li Na and Italy’s Sara Errani, who has had an explosive year in the slams, reaching the Australian quarters and the French final, all while picking up the doubles’ runner up medal in Melbourne and her first doubles’ slam at Roland Garros. The tournament runs for thirteen action-packed days, and with only a couple of weeks left until the first ball is served the time to look at some London hotels in SW19 and catch the best grass court tennis has to offer. Catherine Halsey is based in Edinburgh and writes for a digital marketing company. This article links back to PremierInn. This entry was posted in Tennis and tagged 2010 Australian Open, Andy Murray, britain, British Open, england lawn tennis, French Open, Jo-Wilfried Tsonga, Juan Martin del Potro, Li Na, london, london tourism, Maria Sharapova, Novak Djokovic, Petra Kvitová, Rafael Nadal, roger federer, Sam Stosur, Sara Errani, Serena Williams, Spencer Gore, sports, sports and leisure, Sports Archives, tennis, tennis tournaments, wimbledon championships. Bookmark the permalink.